To me, the very best historical fiction succeeds in doing three things: It makes me learn, it makes me think, and it makes me feel. 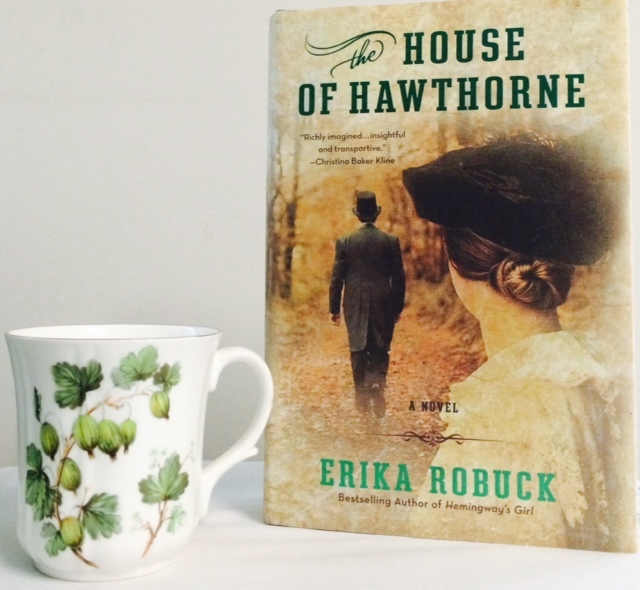 The House of Hawthorne, the newest release by Erika Robuck, not only hits these points, it gets the most golden gold star all over. The House of Hawthorne follows the story of famed author Nathaniel Hawthorne and his wife, Sophia Peabody. Through their meeting, their long courtship and their marriage, their lives, love and losses are chronicled in a beautifully woven story. Drawing on the couple’s journals and correspondence, Robuck does a superb job of bringing to light the history of a woman who sacrificed her own art for family, whose name may be little known, but whose legacy is deeply felt. I fell in love with Erika Robuck’s writing with the release of Hemingway’s Girl three years ago, and I’ve devoured everything she’s written since then. Whether she’s depicting someone I’ve been obsessed with for most of my life (like Papa Hemingway) or someone I know very little about (like Edna St. Vincent Millay), she has a way of making me feel that I know these characters deeply—that they are more than legends on paper, but complicated human beings who could very well be living next door (if we happened to be living a century or two ago). With The House of Hawthorne, she’s done it again, presenting not “the man who wrote The Scarlet Letter and his wife,” but two very real people and the world around them. The other famous figures in these pages—the Alcotts, Margaret Fuller, even President Franklin Pierce—are handled with just as much care, and I came away from this exquisitely researched novel not only with a wealth of emotions, but maybe armed thing or two that could help me on Jeopardy! in the future. As a literature and history nerd growing up in Massachusetts, I was surprised to realize I knew next to nothing about Sophia Peabody. After reading this book, I now know why. This creative, talented and intelligent woman has become a sort of footnote in her husband’s legacy, and I am so thankful that Erika Robuck has given her a voice and shared her story with the world. If you’re a Hawthorne fan, a history buff, or are simply in the market for a wonderful, thought-provoking novel, I highly recommend The House of Hawthorne. For more on Erika Robuck and her utterly fabulous books, visit erikarobuck.com and follow her on Twitter and Facebook. I can’t praise her enough—especially if you’re interested in learning more about the lives of some of the world’s most iconic and fascinating writers! We want to hear what you’re reading this summer! Connect with us on Facebook and Twitter and let’s talk books. Receive Me Falling is the only book of hers I haven’t read! It’s on my list. That must have been a great class!! It really was. She graduated from my school and had the same professor I did, so she popped in to say hi.